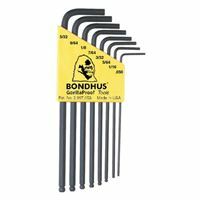 8 piece Ball End L-wrench Inch Set (.050-5/32") Manufactured from Protanium steel. Allows working in hard to reach areas. .050", 1/16", 5/64", 3/32", 7/64", 1/8", 9/64" , 5/32"